Hope you're all keeping well? I've been a busy bee and went on a rather indulgent shopping trip today to celebrate Daniel's first class hons in Mechanical Engineering, but now I'm happy to be sat down enjoying a glass of champagne with Daniel and my family whilst enjoying another great win for Wales in the Euros! I'm here with a sneak peek of my recent monster skincare & beauty haul, which was a total moment of indulgence. I'm hugely into my skincare and of course beauty, and I couldn't wait any longer to share my purchases with you lovelies. However, I will be doing more in-depth reviews on a lot of the products in this post, so keep checking back if you're interested to see how I get along. I hope you enjoy this Post lovelies and I would love to hear from you in the comments section below! So what exactly Did I purchase? Cult Beauty are quite possibly the biggest enablers ever!! Their campaigns are always on point, super informative and more importantly their product selection is just out of this world. I did consider un-subscribing from their e-mails for a while just to stop the temptation, but they are just too good to resist #GuiltyPleasure. 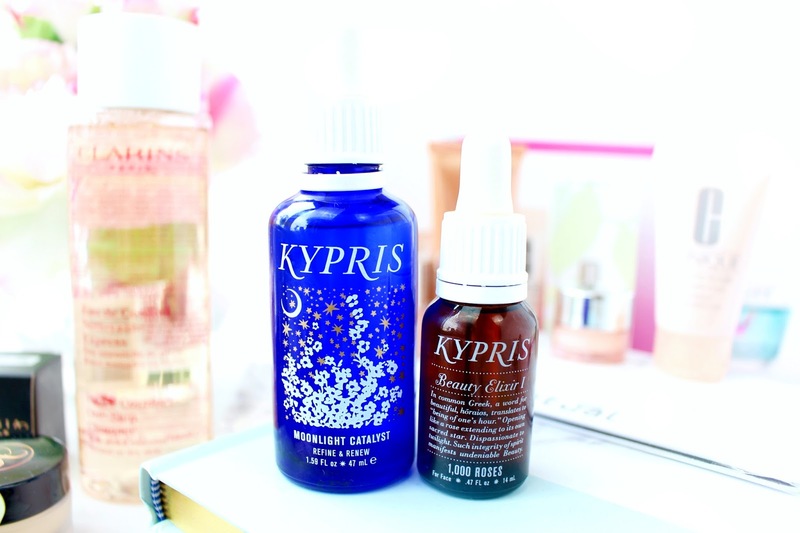 As most of you know I'm a complete skincare Junkie and after speaking with a Cult Beauty specialist, along with reading an amazing post from Caroline Hirons I decided that I needed some Kyrpis in my life! Now I'm not going to go all out in this post, as it totally needs one of it's own, but the two products I purchased were Moonlight Catalyst & Beauty Elixir 1000 Roses. I'm already blown away. I also purchased the Anastasia Beverly Hills Concealer which I've wanted for the longest time! The next day after making my order ABH released their new palettes on CB, so I will be checking them out soon! I don't think the eye palette for me, but the glow kit is 100% up my street. Not only did I get three amazing products, but I also qualified for the super amazing Summer Cult Beauty Goody Bag worth over £170!! Let me know if you would like to see a separate review on the Goody Bag? I've been meaning to re-purchase the Clarins Water Comfort One Step Peach Cleanser for ages, as I've already got through two bottles of it. However, at £23 (Currently £18.45) it's pretty expensive for a cleansing water, so sometimes I just make do with other products I have waiting around to be used up. However, seeing as I was #FeelingSpendy I decided to treat myself to this fantastic product, which I either use alone in the morning, or follow it up with my Oskia Renaissance Gel for a more thorough morning cleanse. I obviously couldn't leave Essential without having a little browse around! I came across Vichy and their new masks, which all looked amazing (I have a thing for face masks) However, I went with the Quenching Mineral Mask, which only needs to be left on for 5 minutes to inject serious hydration to the skin. I haven't actually got anything that similar in my collection, so I'm excited to use this. 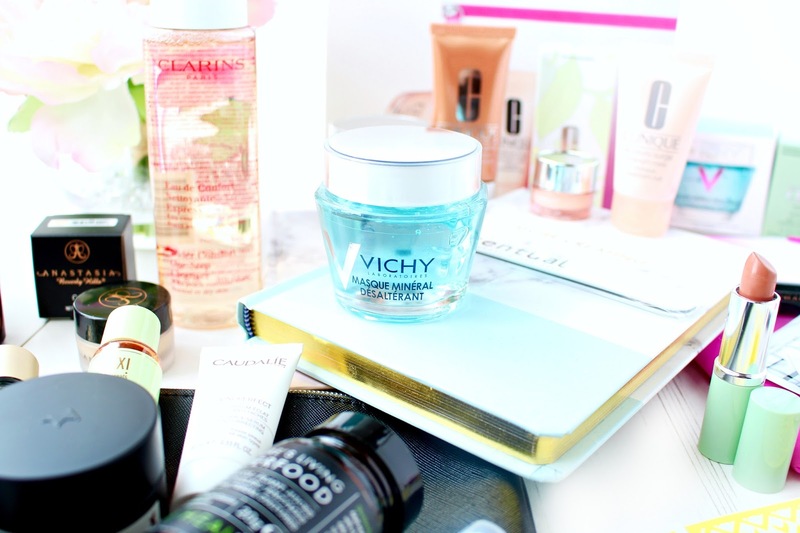 Anyone who knows me well, or reads my blog will know skincare is a big deal for me for many reasons. I've always been lucky to have good skin, but more than anything I love having an in depth routine, as it really helps to relax and ease my anxiety. I also love trying new products and of course keeping my skin in tip top condition, which gives me so much more confidence than make-up these days. 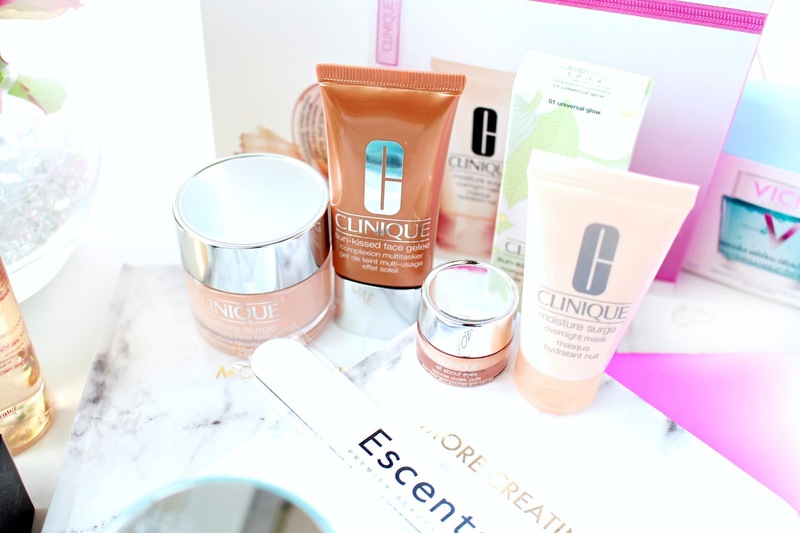 Anyhoo, I'm quite into Clinique at the moment, so I decided to purchase their Moisture Surge Gift set, as I already use the Moisture Surge Thirst Relief Treatment and love it! I also purchased their NEW online exclusive Sun-kissed Face Jelee Complexion Multitasker, which I'm hoping will be fab to mix in with moisturisers, foundations and anything else I can use it for! I also got a free men's skincare set, which I have given to Daniel. I'm desperately trying to get him into skincare, as I can't bare to see him wash his face with soap anymore! I hope you've enjoyed this post my lovelies and I will be back soon with more in-depth reviews! Please let me know if there are any specific products you would like to know about? 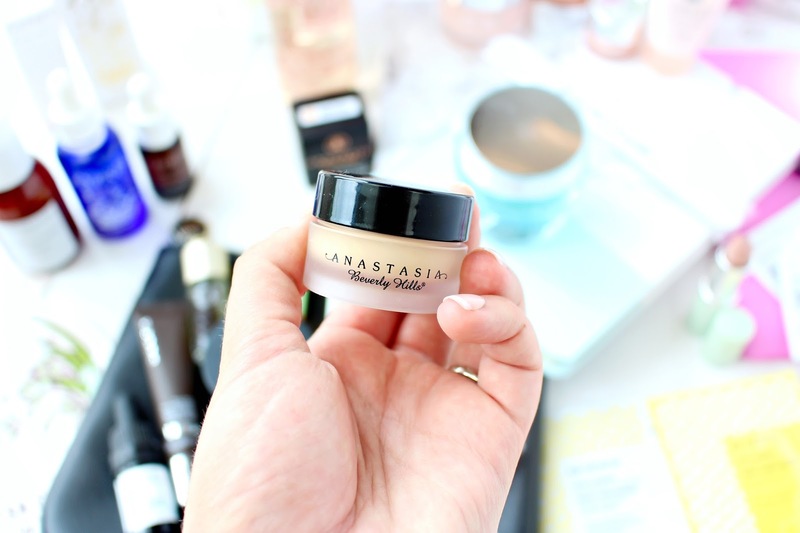 Ooh the Anastasia concealer interests me, are you going to be using it for brow shaping or general concealing? I want the new ABH palette so much, the colours are so different to everything else I own. Wow I'm a little (A LOT) jealous of this haul! I love Clinique too, they have some amazing products. 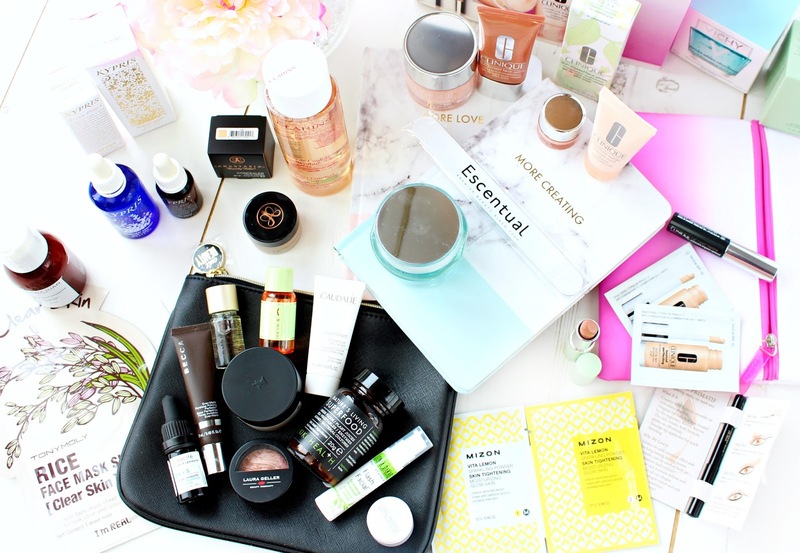 I'd love to see what is in the Cult Beauty goody bag too! I used to use Clinique all the time when I was a teenager, but it was just so expensive, although the results were pretty good. Fab haul.